Scarborough Garden Apartment is located high on the hill in Scarborough, near to Scarborough Beach and minutes away from public transport, shops and cafes. It is well located to visit our wonderful beaches yet still not too far from Perth city. The apartment suits couples seeking a comfortable home-away-from-home while visiting Perth. Scarborough Beach, famous for its surf, is just a 20 minute walk away or a couple of minutes by car or bus. If surfing is not for you, there are many other lovely beaches within easy reach. The bus stop is just around the corner from the apartment taking you either to the beaches or into Perth city. Hillarys Boat Harbour is only a 15 minute drive north along the scenic West Coast Drive. The port city of Fremantle is a 25 minute drive along the coast to the south of Scarborough. A 30 minute drive to the east will take you to the Swan Valley with its many wineries, breweries, galleries and restaurants. There are both public and private golf courses within 10 minutes drive. Scarborough Garden Apartment is on the ground floor of a two storey home. It is modern and totally self-contained entering through a private garden. The accommodation is tastefully decorated and consists of one bedroom with a queen size bed, bathroom with bath and separate shower, toilet, kitchenette/laundry including washing machine and dryer. The spacious living room opens out onto a private courtyard and garden with use of BBQ. The owners live upstairs, which has a separate entrance and are happy to assist you with any local information you may be seeking. Please note that this is strictly 'No smoking' accommodation both in the apartment and in the patio and garden. Our maximum booking period is for 2 weeks and our rates are for 2 people and include bed linen and towels. Visitors will receive a complimentary Welcome Basket including tea, coffee, sugar and milk to enable you to relax on arrival. I was in Perth for a conference & to visit my family. Barry & Carole's apartment was perfect for me, as being coeliac I tend to travel with frozen meals so that I can reheat and then run along to the next thing. 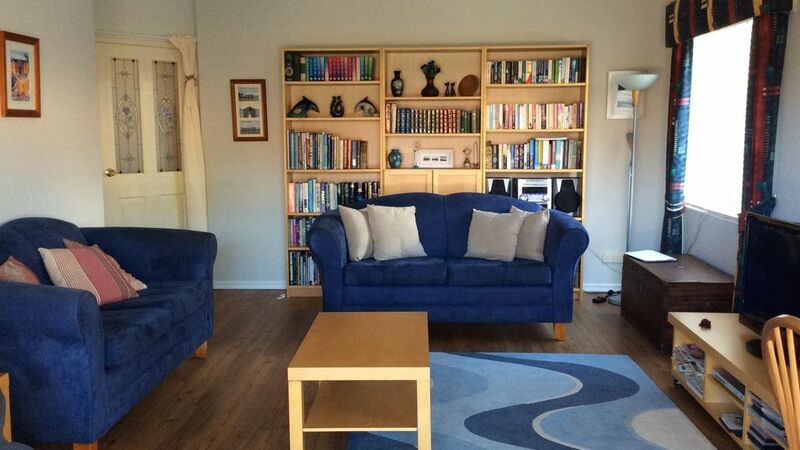 Barry and Carole were very helpful and their apartment was a lovely place to relax and unwind. I particularly enjoyed the easy access to the new 50m pool down at the esplanade as it was so easy to pop out & do laps & just a five minute run home in my hire car. I will definitely be staying there again next time I need to travel to Perth. Thank you Sarah. We are glad you enjoyed your stay and look forward to seeing you again. What a great find. Spotless and Comfortable. Everything you could want (and more) in terms of kitchen equipment. The bedroom has black out curtains and the shower is great. Nice outside sitting area. Close to shops and a bus stop at the end of the road, with busses going past every few minutes. We also walked down to the beach in around 15 mins. Barry and Carole were great hosts (sorry we couldn't come out on the boat with you). Many thanks for making our two weeks a home away from home. One tip - if you get a bus to the train station, your ticket is valid for two hours on busses and trains. Thank you Sandy. Glad you had an enjoyable stay. Clean , well kited out , great value , can't fault it. Thank you Phil. Glad you enjoyed your stay. Excellent condition with all our needs provided. A quiet and very clean apartment where you felt you were living in a home rather than an apartment. Pleasant garden area to sit out and a close walk to the shops for essential items. Friendly and helpful owners if needed. A perfect stay of one week. Everything thought of in a lovely apartment. We would have no hesitation in coming back.